Early Childhood Council of Larimer County (ECCLC) helps child care services and families connect to find resources that can help both thrive. The Early Childhood Council of Larimer County (ECCLC) is one of Colorado's 31 Early Childhood Councils working to improve services to children and families. The Councils focus their efforts on improving availability and quality of services in the areas of family support and education, health & well-being, and learning & development. Folsom helped ECCLC create a captivating website with several custom features that were designed to help maximize communication while reducing the overhead of managing the website. 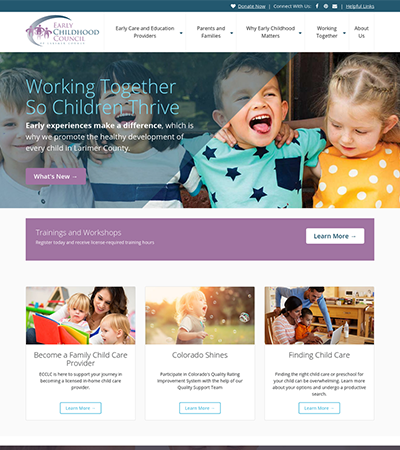 Within a short few weeks Folsom was able to capture ECCLC's unique branding and design requests to create an engaging mobile friendly website.